IrishTrucker - Garahy’s Garage does it again! Garahy’s Garage does it again! Garahy’s Garage scooped the prestigious LCV / HCV Independent Workshop of the Year Award at the 2018 Irish Auto Trade Awards in Carton House, Maynooth on October 26 last. It was the second time in three years that the Birr-based Test & Service Centre was crowned overall winner in a category that featured some stiff competition. The Irish Auto Trade Awards recognise the best operators in all sectors of the Irish auto aftermarket so it speaks volumes for the high level of service offered by Garahy’s that they have been honoured once again as LCV / HCV Independent Workshop of the Year for Leinster (excluding Co. Dublin) and Ireland. The categories cover main dealership aftersales; independent workshops (servicing and repairs from cars through to trucks and buses); manufacturer and dealership parts suppliers; wholesale and retail motor factors; bodyshop / refinishers; body builders / convertors; recovery operators; tyre manufacturers; wholesale and retailers and manufacturer innovations. “We were delighted to receive the regional and national awards in our category,” says Garahy’s workshop manager Dan Cussen. Incorporating a CVRT Centre and a Service & Repair Garage, Garahy’s has been trading for over 50 years. It was established by Thomas Garahy, but has been headed up for the past 30 years by his son Kieran, who trained as a tractor mechanic before branching into truck repairs. The family-run business is located on a two-acre site in Fortal, which is just outside Birr on the Clareen Road. 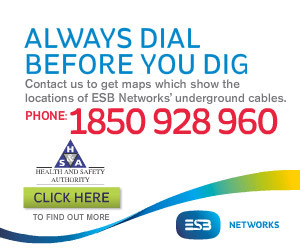 Its central location makes it easy to access from all parts of the country. Garahy’s state-of-the-art, purpose-built CVRT Test and Service Centre provides a range of services to commercial vehicle owners, from CVRT Light Testing (4x4s and vans) and Heavy Testing (trucks and buses) to services and repairs. The garage also stocks a wide range of truck and trailer spares, including parts for the common test fails which allows it to offer a speedy turnaround time from fail to pass. Scania, Volvo, SAF, BPW, Rubbolite, Mobil, VDO, Meritor, Bosch, Diesel Technics, Wabco, Haldex and Knorr-Bremse are among the genuine parts stocked. Garahy’s CVRT Test Centre is one of the busiest in the midlands. It is also one of the longest-established in the region, having started out as a DOE Test Centre 18 years ago, and is part of a network of independently-owned CVRT Test Centres dotted throughout the country which carry out inspections of behalf of the RSA on all commercial vehicles. The CVRT inspection includes checking brakes, lights, markings, wheels and tyres, steering and suspension, chassis and underbody, tachograph, speed limiter, exhaust emissions, electrical systems, glass, mirrors and more. The purpose of the test is to ensure that these vehicles are in good condition throughout their entire life. The award-winning garage has invested heavily in the latest equipment for testing all LCV and HCV commercial vehicles. Garahy’s believe in delivering the highest standards of excellence to their customers and adhere to the strict guidelines laid out by the RSA. They are fully insured and their highly-qualified team are trained to industry set standards with safety being their number one priority at all times. Garahy’s friendly staff will be more than happy to answer any questions you may have, before and after the test. Customers can relax with a cup of tea or coffee in the waiting area while the test is being completed. Opening hours are 9am to 6pm Monday-Friday and 9am to 1pm on Saturdays. Bookings are taken over the phone or online. Garahy’s endeavour to accommodate their customers at a time that suits them. The Co. Offaly company has built up a large customer-base which includes semi-state bodies, road hauliers and nationwide bus companies. “We always regard the customer as king,” Dan stresses. 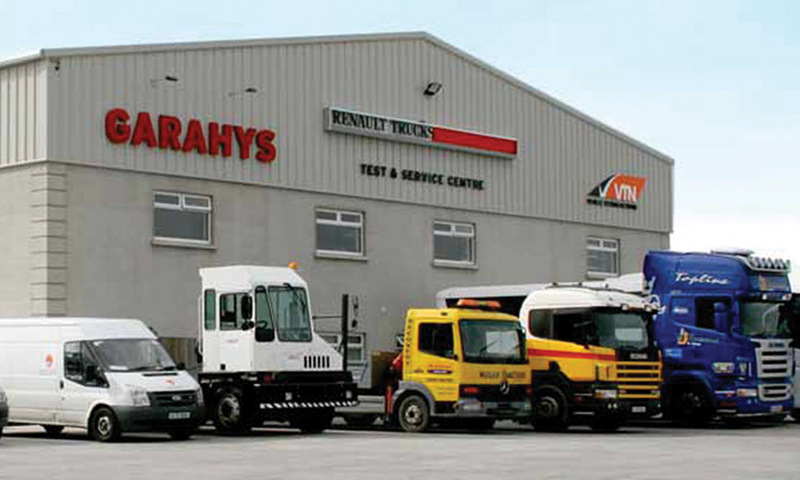 Garahy’s Service & Repair Garage can cater for the heaviest commercial vehicles. With over 30 years’ experience in the business, Kieran Garahy is regarded as a leading expert in Scania truck and buses. Combined, Garahy’s CVRT Test Centre and Garahy’s Service & Repair Centre is a one-stop shop for all your vehicle testing, LCV / HCV servicing and repairs, tachograph calibration and vehicle plating needs.